It’s been hot and peaches have been cheap, but I was faced with an inability to consume 7 peaches in one day and from ripe they transitioned to slightly fuzzy looking, so I made sorbet. The photo below isn’t great because it was a speedy snap while dishing it out to guests, hoping it wouldn’t melt. 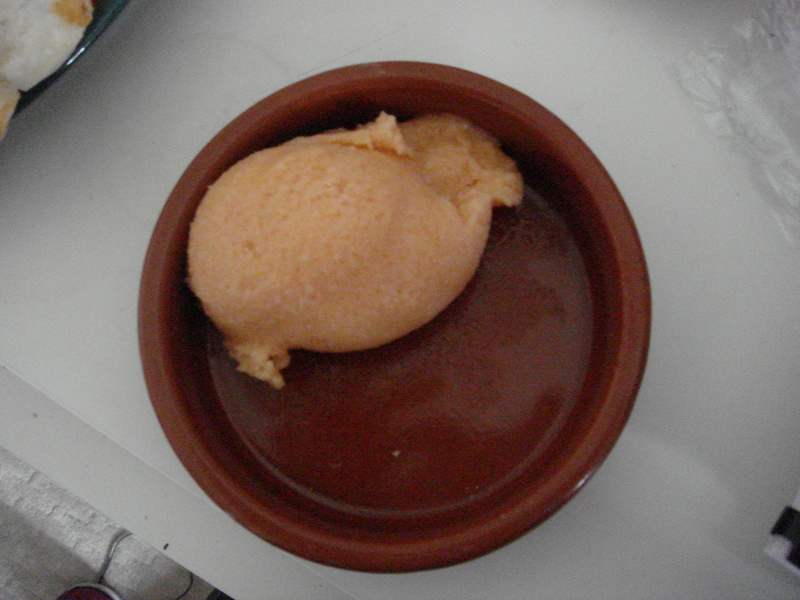 I suppose it’s a healthy-ish summer treat because I didn’t strain the puree at all so there was lots of peach pulp in the sorbet. This was good for more than just fibre reasons, though, I think the puree helped keep the texture soft and spoonable, which was particularly important as I don’t have an ice cream machine. The simple syrup I made was flavoured with cinnamon and star anise; I was on the fence about them initially because while they added complexity I occasionally thought they overpowered the peach a bit. However some people said the spices brought out the flavour of the peaches and I did like the mysterious note they struck. If you want pure peachiness then reduce or omit the spices. I used the juice of a lemon and a clementine as that was what I had but it should be fine to just use orange juice! 2) Meanwhile, make the syrup. Bring the sugar, water and spices to a boil in a saucepan and simmer for about 10 minutes, until thick and syrupy. This may take more than 10 minutes. 4) Place the peaches in a food processor and puree. Add the lemon juice and clementine/orange juice and egg white and blitz to combine. 5) Strain the sugar syrup and add to the peach puree. You need to taste continually here and add gradually as the amount of syrup you need depends on the sweetness of the peaches. Add until it’s sweeter than you think necessary because the sweetness is muted upon freezing. Blitz to combine. 6) Freeze in a shallow container and occasionally take out of the freezer and scrape with a fork. Most recipes say to do this every half hour until solid but I just did it every now and then and then went to bed. 7) The next day scrape the frozen puree with a fork then put in the food processor and blitz. The sorbet mixture was soft enough to do this. You’ll see it go much lighter in colour as the air is whipped into this. Return the mixture to the container and leave it for an hour or two, then repeat the blizting procedure to get it completely smooth and aerated. Previous Previous post: TIPS: run out of yoghurt?